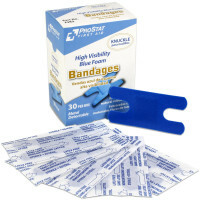 These Latex Free Hi-Vis Blue Foam Metal Detectable bandages are required in many foodservice and pharmaceutical processes, and recommended for other uses where contamination prevention is important. The bright blue foam material will make locating lost bandages visually easy, while they are also metal detectable for discovery in critical processes. Foam bandage offer the added benefit of being suitable for application to infected wounds. Sterility Guaranteed unless individual wrapper is damaged or opened. Other benefits of foam wound dressing include not adhering to the wound as a normal fabric or plastic bandage may - making them easier to apply and remove, these foam bandages also serve as a cushion to protect the affected area. Seek professional help in medical emergencies. 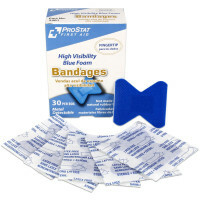 1" x 3" Blue Foam Metal Detectable Adhesive Bandages - 40 per Box - 2381.